If you're looking for Indian fast food and want a good variety, this is the place. After been to the other outlets, I visited the one in Barsha. Finding a parking spot during the evening may not be so easy. To start with, we had a plate of pani puri each. This one is really delicious. The "pani" is spicy and has the right amount of spices to it. 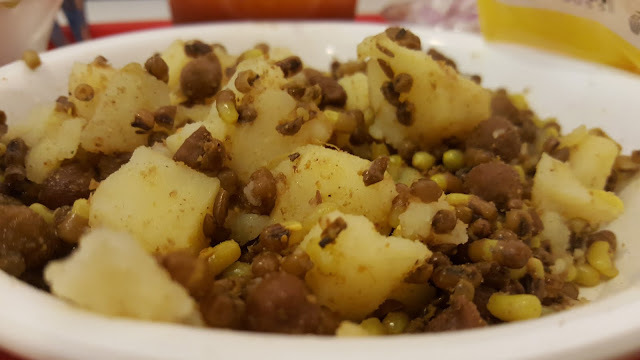 Along with that they give you the mix of spiced potatoes, chana, and moong. We didn't like the one which they gave initially, so they made us a fresh one. They give you a pack of puris with it, and you can add the things as per your liking. Of-course, this doesn't give the feel of standing there and eating while they make and give you, but the taste is really good, so I don't mind. Saj is one of the two famous traditional Arabic breads and these guys specialize in that. They don't have too many other dishes so that they can focus on what they do best. I, along with a few bloggers was invited to this place for tasting. 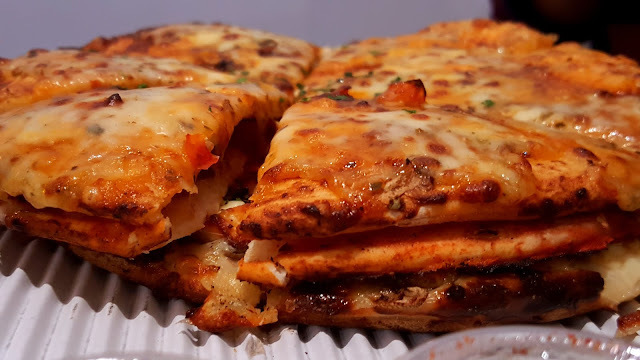 It was a bit difficult to find, and it is a small place too; but since their primary focus is on deliveries and take-away, hence these factors don't matter much. served that I had to order some water before that. For the appetizers, we had crispy Halloumi sticks and crispy chicken sticks. The crispy Halloumi sticks is an unique item, but not something all that great. The crispy chicken sticks were good though, and tasted better with the sauces served with it. I especially liked the honey mustard sauce. State 88 has just opened about two months ago by two brothers who love sandwiches and wanted to create something unique. They love the number '8', and it also happens to look like a rotated infinity sign - and that is the limit for their menu items - infinite. Their restaurant is based on a few values or what they call 'articles of constitution' just like a state would; and that's where the name comes from. 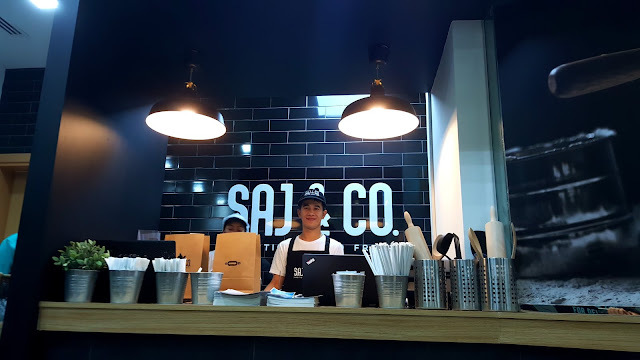 I got an invite from the restaurant and at first when I saw this place online, I though it's just another sandwich place, but the photos were tempting and they had some innovative items, which is why I was looking forward to it. Upon entering, I was greeted by a waiter called James. He was friendly and showed us to a table. The place is rustic, yet classy. It has interesting qoutations written everywhere. 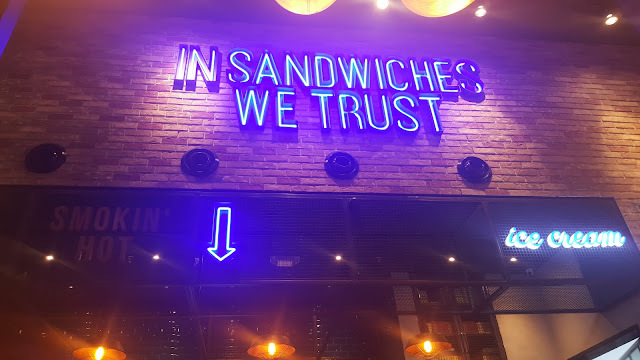 They've got a good selection of sandwiches and also have salads, drinks and dessert. We decided to start with a salad and a couple of drinks. 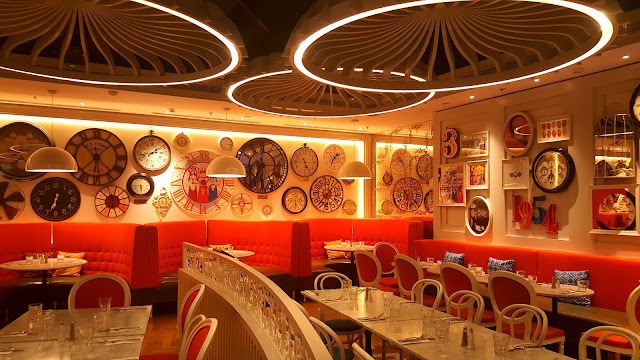 This place has a very chic ambience, and a tad bit girly too. A friend of mine sugested we go there, and so we did. The interiors looked very inviting and it looked like a good place overall. It was a weekday evening and there was hardly any customer there. We got a very comfortable sofa to sit on. To start with, we ordered a sweet potato fries. The fries were nice but could have been better. Usually when I have sweet potato fries, I'm hardly able to contain myself, but these were resistible. Other places gives specific sauces with it on request, but here they didn't have them. After that we ordered an Alfredo Pasta. The pasta was delicious, but the sad part was that it had very few pieces of broccoli and tomatoes. This was a bit of a let down. Imagine you are sharing with someone, and both of you hardly gt a piece or two each. Also, surprisingly, they mention the broccoli and the tomato in their menu description. I've had Debonair's pizza earlier from another outlet of their's. Since I was in the Downtown area, decided to check out this outlet. I read that they are located in the food court in Dubai mall; by default, I went to the food court on the top floor. Unfortunately it is located in the other one which is on the Lower Ground level. 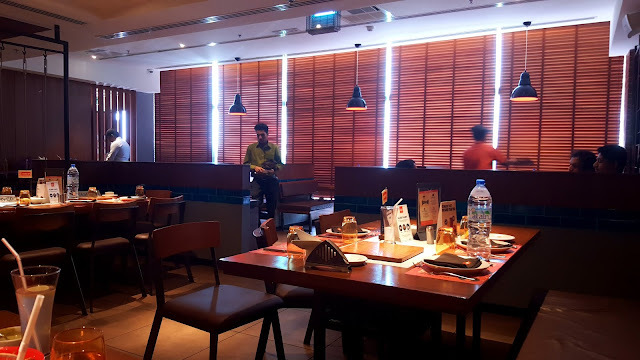 As of writing this blog, this particular area of Dubai mall is still expanding, and this restaurant seemed really hidden inside,to the point that we almost thought that it isn't there. They've got a good selection of pizzas. They've got a few choices in vegetarian too. We were a bit confused what to order, and 'Joyce', who was taking our order suggested that we go for the "Meal for 2" combo, which made sense. Barbeque Nation is widely known in India and it is my favorite restaurants for unlimited barbeque and food. In Dubai, they've been around for about a year, but I hadn't visited them until this day. They were promoting this to other nationalities too and so there was a competition on Radio Spice where I had to nominate a non-Indian friend of mine and we could win invites for two. I nominated, and I won ! I went there along with a Filipino friend of mine. They have a huge buffet laid out and they also get the grills on your table. They have live stations too. There was one where they were grilling meats, one where they were grilling vegetables, and a chaat counter too. We took some fish from the live grill. This tasted really delicious. It was well cooked, soft and had a great flavor to it. I also took a pani-puri from the chaat counter. It was okay. They also had keema-pav. It is one of my favorite snack, and I loved this one.